Impossibly cute, and impossibly blocky. Anything blocky piques my interest these days, mainly because of the cute factor and the possibilities it brings. 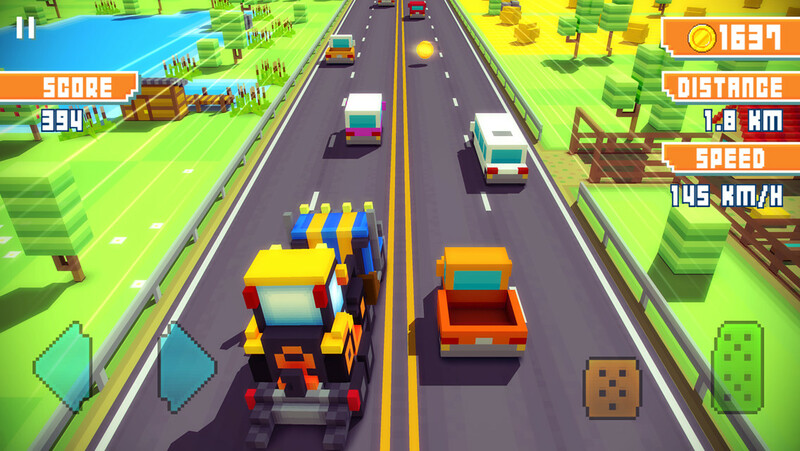 Blocky Highway from Dogbyte Games is one title that has me quite interested, mostly because it's got some new riffs on the same old tired gameplay we're used to. Check out the trailer and you'll see some very silly vehicles here and there, as well as some other interesting vehicles to collect and careen down the road with. It's out this Thursday on the App Store, and I rather like what I've seen here, so I'll likely do some impressions on it. At the very least, it reminds me of classic gaming or even that of Crossy Road and the excellent Pac-Man 256. Both are fantastic and you should check them out immediately. Go! No excuse not to!